Weekends are for relaxing, right? With our crazy lives, juggling the very active schedules of four kids, we don’t always get to do a lot of relaxing most weekends. But I try to sneak in at least a few minutes of down time on Saturday and Sunday. 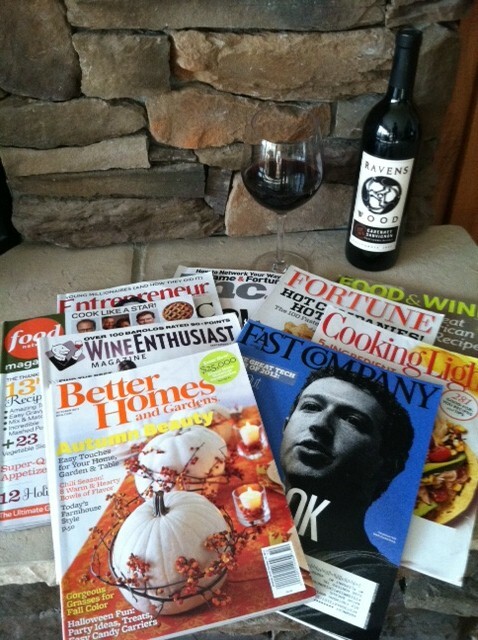 One of my favorite ways to relax is with a stack of magazines and a glass of red wine. Magazines are one of my simple pleasures. Despite of all the technology today, magazines are not dead. Far from it, actually. I applaud and very much agree with the recent advertising campaign created by a group of the leading publishers in the industry called Magazines – The Power of Print. The double-truck ads in most of the top publications spell out the growth and popularity of magazines, explaining that readership among 18-34 year olds is growing, and even more interesting since Facebook was founded, magazines have gained more than one million young adult readers. I’ve subscribed for years to a couple favorite titles. My top two are Fast Company and Better Homes & Gardens. Two significantly different types of content, I know. But I love them both. What I like most about these two publications goes beyond the editorial. Don’t get me wrong, the articles are always well-written, interesting, thought provoking and motivating. However, it’s the overall layout that grabs me and keeps me coming back for more. As a writer, editor and publisher myself I’m fully aware of the important role graphic design plays in bringing words to life. You could say I have become somewhat of a graphic design snob. My expectations for design are very high. To make it into my magazine pile a publication has to be filled with compelling articles presented in a format that’s fresh, contemporary, fun and easy-to-read. If the layout is too busy or the articles are too long, sorry … it’s off my pile. After all, my relaxation time is limited. I have to be very selective. While I have my favorites, which are delivered in my mailbox every month, I am always open to new titles. In adding new magazines to my pile, I’ll often visit our local library and peruse the extensive collection of magazines. I always leave the Chippewa River District Library with an armful of recent issues of a variety of publications. Some magazines may make into my pile once, but only the good ones make it twice. Recently I picked up copies of a couple magazines I haven’t seen in awhile. New to my pile this week is Food & Wine, Wine Enthusiast and Cooking Light. Food Network has made it to my pile for several months in a row now. I’m considering a subscription. While at the library, I couldn’t resist grabbing a few past issues of some of my other favorites, as well — Fortune, Inc. and Entrepreneur Magazine. On a good weekend, I am typically able to flip through the pages of at least half the magazines in my pile. With close to 10 titles in my pile, I am hopeful for a good bit relaxation this weekend. I’d love to hear what’s in your pile. Perhaps I’ll add your favorite magazine to my pile!